“I have always loved the desert. One sits down on a desert sand dune, sees nothing, hears nothing. The Three Muses asked for White Space which means that two thirds of the space should be relatively unadorned. 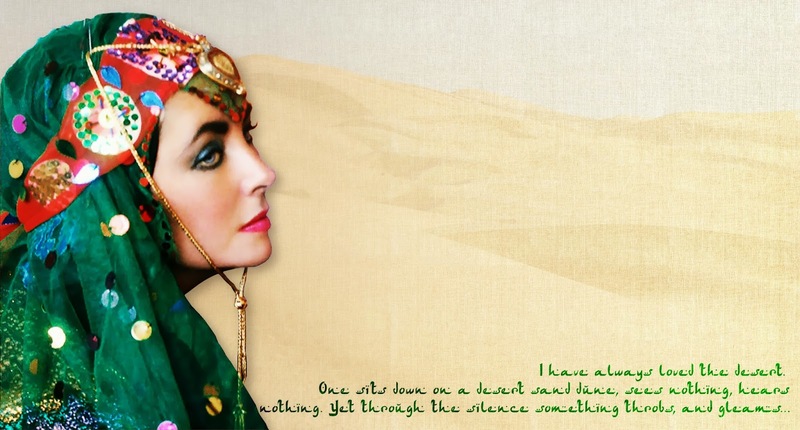 I went for deserts and when I was looking for odalisques I stumbled with this magnificent photo of Elizabeth Taylor by Firooz Zahedi. As the copy was very poor I had to work on it a little bit. Background is a photo of the Imperial Sand Dunes Recreation Area, the Algodones Dunes, in California. Font is Arab Dances. I also used a linen texture. This is so beautiful, Chris. The image is wonderful, especially as it started out as a poor copy. I love the brilliant colour against the textured sands and I love your use of white space which certainly proves that sometimes less is more. Love the rich colours of your image against the 'sand,' Christine, a stunning piece! Lovely design and colours, Christine. Liz is stunningly beautiful. This is stunning, Chris, and so beautifully crafted. Oh, Chris, this is a glorious piece of art. It's a stunning image of Taylor, the accompanying prose is perfect, and the end result is perfection! Take a big bow, my friend, the loud applause is coming all the way from Indiana!! Que coisa mais linda Chris!Tenho sentido sua falta no Digitalmania. Liz's gorgeous and colorful outfit makes a great foil to your stark and lovely desert...very beautiful. This is amazing! Love what you have created here..gorgeous! This is absolutely beautiful! The green against the sand is stunning.